© Copyright – Scottish Daily Record Ltd. – Reproduced by kind permission of Scottish Daily Record Ltd.
Tollcross Road disturbance circa 1930’s. Seven people were arrested and three people were injured. The disturbance took place outside the tramway depot. What do you know of this incident? 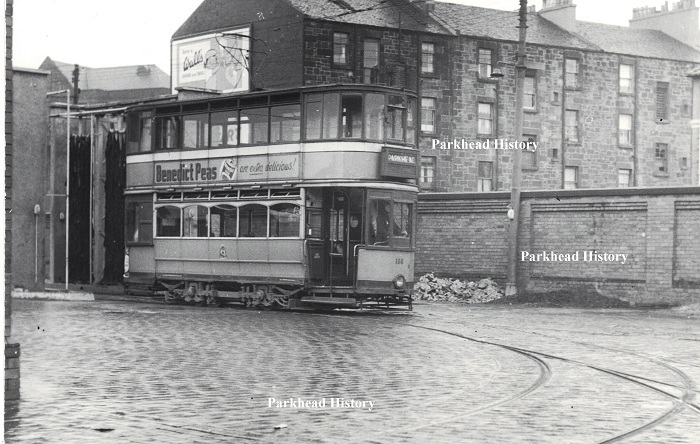 Standard Tram Car exiting from automatic wash in Parkhead Depot. The rear of the tenements of Tollcross road in the background with adverts on the gable end in Canmore Street. The rooftop of Quarry Brae School can also be seen in the background to the left of the gable end. 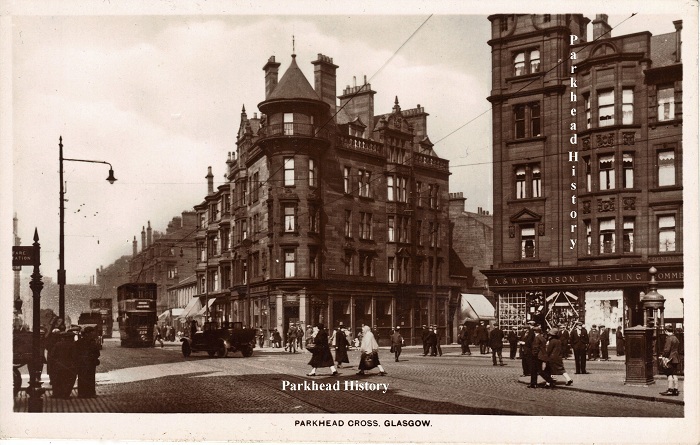 Parkhead Cross circa 1911. Another shot of a busy Parkhead Cross with the delivery of Barrs products in progress. Drumother Mansions, Tollcross Road. 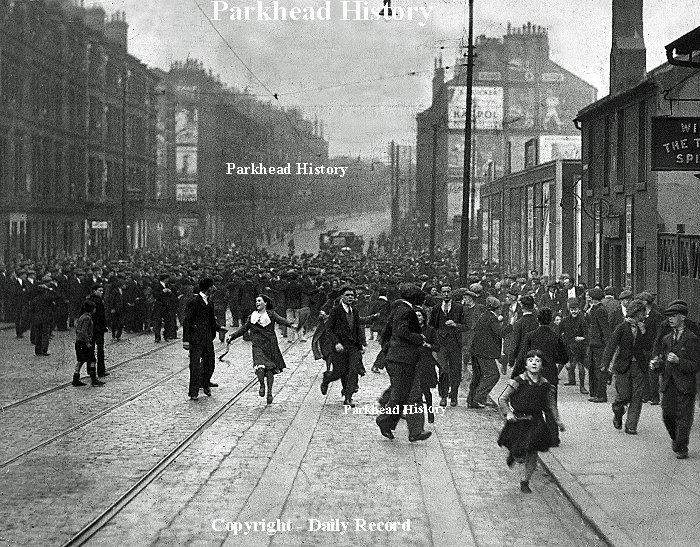 Parkhead. The gable end on the left of the picture is the corner of Drumother Hill or Drumother Drive now known as Drumover Drive. 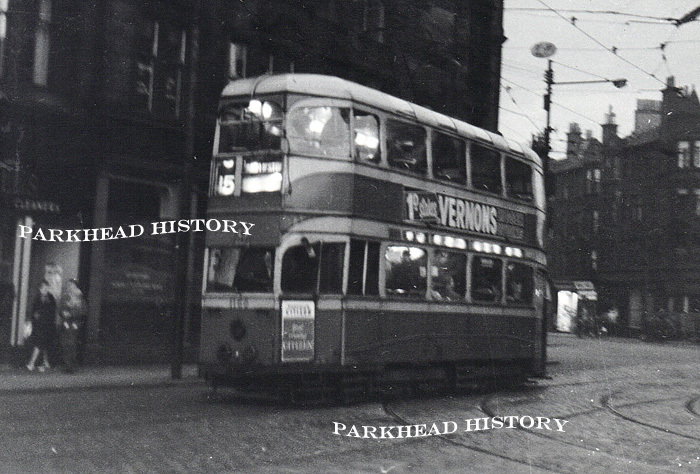 Standard Tram 352 on number 29 service on Parkhead Cross passing Duke Street. Copyright © Culture & Sports Glasgow (Museums). Reproduced by kind permission of Culture & Sports Glasgow (Museums). 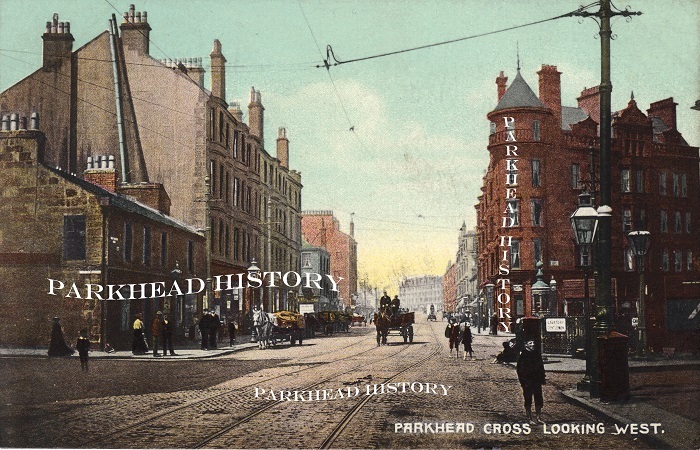 Parkhead Cross on Great Eestern Road at the junction with Burgher Street Circa 1900. Note the newspaper boys on the left, one who is barefoot. 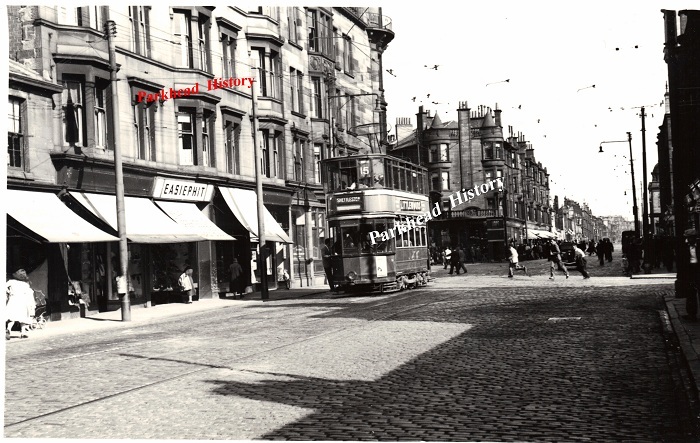 Parkhead Cross with Burgher Street on the left, Duke Street on the right and Gallowgate straight ahead. On the right is the gents underground toilet and the marble drinking fountain. This a a 1953 shot of Parkhead Cross looking east from the Gallowgate along Tollcross Road with Springfield Road to the immediate right and Westmuir Street to the left of the cross. 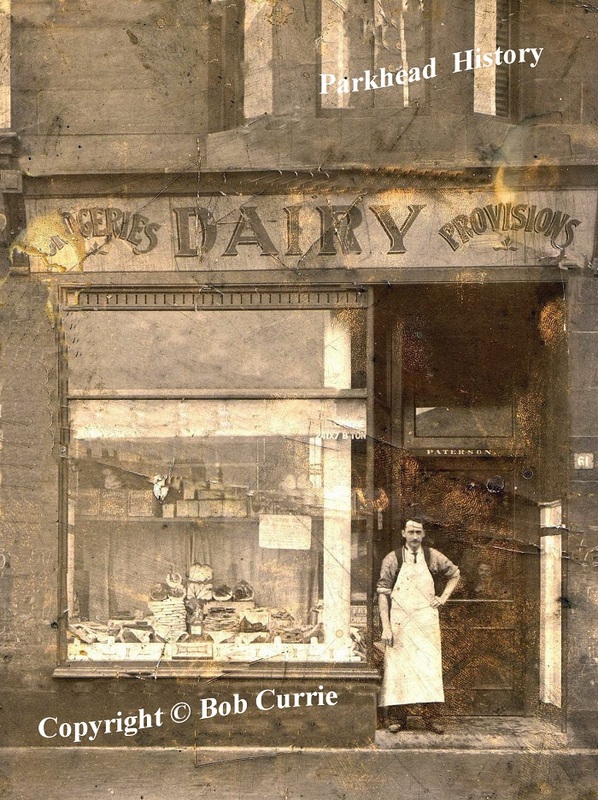 Robert McMillan Paterson at the doorway of his groceries and provisions store at 61 Crail Street, Parkhead circa 1920. 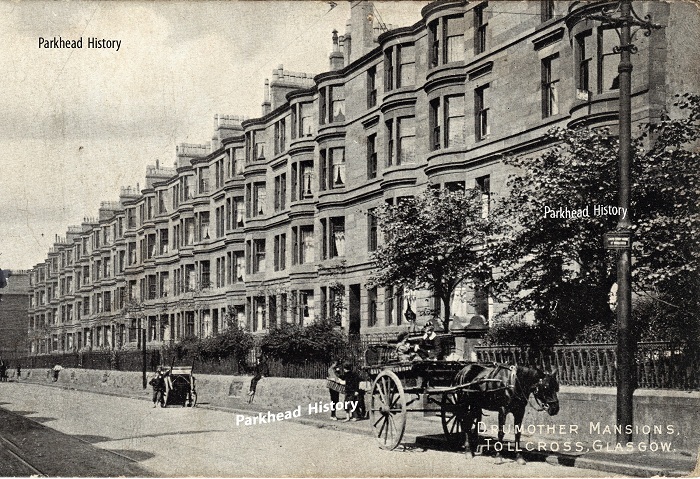 Robert Paterson was in the dairy and grocery trade in Parkhead for forty years. However owing to wartime conditions, he retired in 1941 to reside at Kirn, Dunoon, Argyleshire. 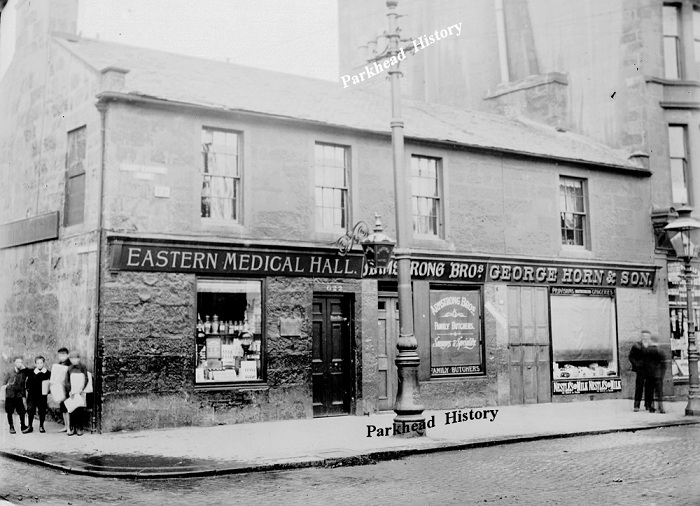 The Eastern Standard newspaper of 1944 reported that Mr. Paterson, late of 122 Main Street, Bridgeton was well known in the East End of Glasgow. 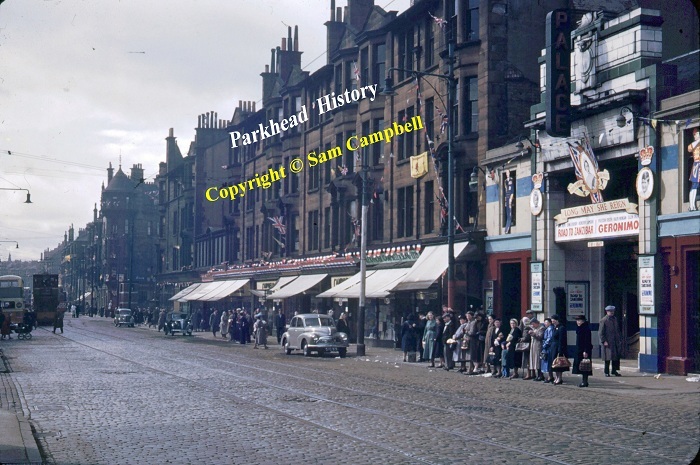 Circa 1963: Campbells of Parkhead shops bedecked for the commemoration of the 10th anniversary of the Coronation. 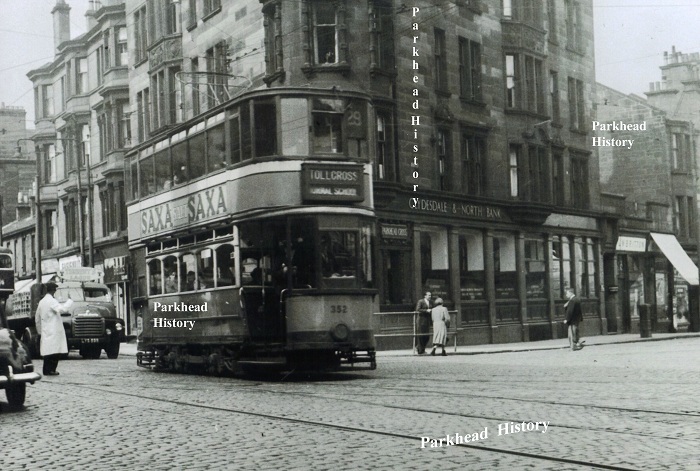 On the right of the picture is the Parkhead Picture Palace or 3P’s as it was known locally. Films on show are Geronimo (released 1962) and starred Chuck Connors and Kamala Devi and Road to Zanzibar which starred Bing Crosby, Bob Hope and Dorpthy Lamour. 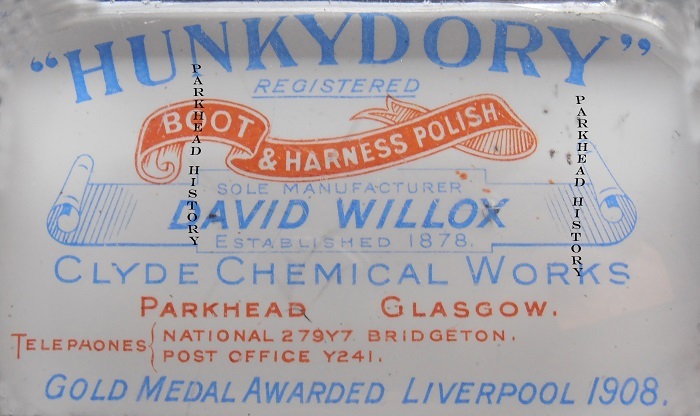 “Hunkydory” an old word from the past but does anybody remember the product from a well known Parkhead character? 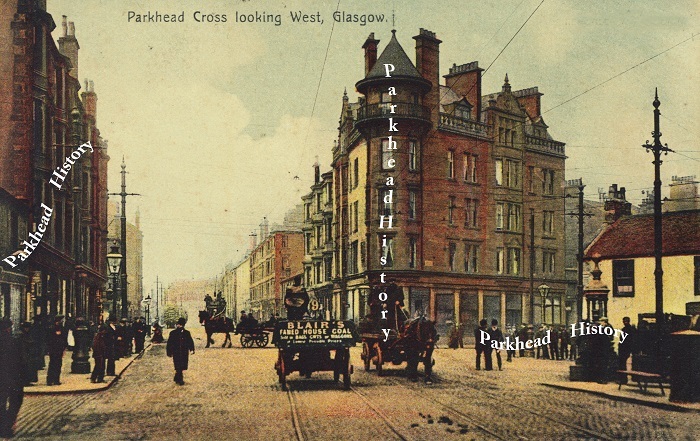 Parkhead Cross with Westmuir Street in the background. 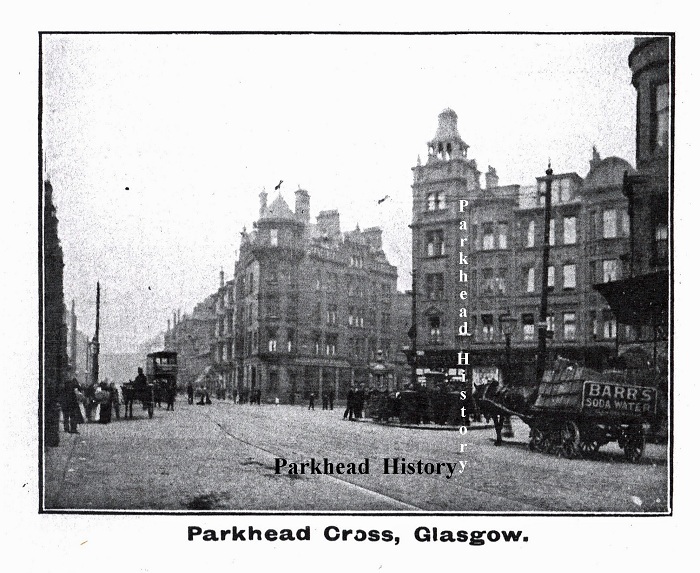 Parkhead Cross with Blair’s Coal Cart on middle of Cross. New Road (Duke St.) to the right and Burgher St. to the left and the old marble drinking fountain. Ah the three P’s , fond memories of Saturday mornings, coming out and galloping down the pavement slapping your backside if you had seen a cowboy film.